Have you ever got frustrated with big mirrorless or DSLR camera just because of the sheer size and weight of it? Well, you are not alone. In my early days of photography, I always wished for a camera that fits in my pocket easily and is just as powerful. Back then it was a far cry to even think of something like that. But now it has become a reality. Manufacturers are forced to put more advanced features in their compact camera models thanks to the ever-improving smartphone cameras. This has made life for us quick snappers a breeze. We now have the power to take DSLR quality photos at the palms of our hand. However, finding what fits your needs the “Best,” can be a bit tricky. Especially considering how every company claims that it produces the best compact and lightweight cameras. That’s where this little article of mine comes into play. In this article or guide (whatever you decide to call it), I’ll give you 10 compact cameras that I believe are the best in the market as of current research. Let’s take a deeper dive into the world of compact camera, shall we? Before we jump straight into the review section, I’d like to discuss a few compact camera terms. Knowing these terms are essential in understanding the quality of a camera. Please keep in mind this section is dedicated to the beginners. If you are a pro at photography and have decent knowledge about camera jargons, feel free to skip. This perhaps is the most common term in the world of photography. In baby language, aperture dictates the size of the opening in the lens. For instance, think of the lens as a window. In the real world, larger or wider the window, the more light can come through it and vice versa. The unit of aperture is measured in F-stops. F-stops or focal length and aperture are inversely proportional. Meaning the bigger F-stops implies less light. For instance, f/1.8 is wide angle and lets in more light than a lens with an f/2.2 aperture. In general, you want a balance between everything. More light doesn’t always ensure sharp and crisp image quality. Bokes is an effect that is caused by the out of focus lights. Nowadays, you can find portrait mode in almost every smartphone camera. Some of them do via software and some via hardware. For compact cameras, this neat little effect is created via the lens itself. Basically, what it does is, focuses on the subject only and blurs out the rest of the image. This is achieved when the foreground is focused but the background is out of focus. This is also something to be really careful about in the world of photography. Aspect ratio is simply the ratio of height and width. An aspect ratio of 4:3 means the height of the image is 4/3 times bigger than the width. Aspect ratio also dictates different sizes for the images. For instance, an aspect ratio of 4:7 would imply the image is a bit wider. Similarly, the aspect ratio of 4:4 would give you a square sized image. Have you ever felt the need to take more than one photo at a time? This is where burst mode comes in. Burst mode enables you to take continuous snaps of something without doing anything. Your camera does everything for you. This comes really handy in wildlife photography (or any other type of photography that requires instantaneous snap) as you only get one chance to capture the best moment. Exposure of an image implies how dark or light the image is. Every time you click the shutter button the camera sensor is exposed to light and a photo is created. This is where the exposure originates from. If your photo is darker then it was underexposed. On the other hand, if it captured too much light, it was overexposed. Exposure of an image depends on various factors like shutter speed, ISO, aperture etc. Exposure can be controlled via tweaking these variables. For the sake of simplicity and beginner-friendliness, I’ll stop here. If you want a more in-depth analysis of other camera terms like ISO, white balance, focus, viewfinder, hot shoe etc... Feel free to let me know in the comment section below. For this review piece, I’ve compiled a list of 10 compact cameras that I believe are the best. Keep in mind all of them were chosen based on the features and capabilities they have (and also a grain of my personal opinion). There you go, the aforementioned are the compact digital cameras that we will take a look at. Without any further ado, let’s get right into it. I don’t think Sony as a camera manufacturer company needs any introduction. They’ve always produced top quality camera sensors and RX100 VI is no slouch either. It comes with a 24-200 mm sensor. That’s plenty for professional photographers. The lens has a variable aperture of F2.2 – F4.5. The main advantage of a sensor with a variable aperture is the ability to change aperture based on the lighting condition. With these, you are always ready to shoot DSLR quality photos in any lighting condition. Just change the aperture based on your likings and you are all set to go. We all know how important focus is when it comes to photography. Manual focus is such a drag for quick snapping. You place your subject, you move the camera lens a little bit and after all that, you are ready to take a picture. It is such a time-consuming process. Even then, sometimes we don’t get the expected output thanks to the focus error. That’s why like every other compact digital camera, this one also comes with autofocus. But not just any type of autofocus system, it comes with the world’s fastest autofocus (only .0.03 sec). By fastest I mean lightning fast. I’d highly urge you guys to try it yourself. The autofocus in this camera is mind-blowing. Burst mode of this camera is also very fast. This comes really handy in certain situations. The screen of Sony RX100 is a touchscreen display (finally! Sony!). So, that’s a relief. The body of this camera is also well built. With top of the line raw material and durable construction, day to day rough use is not an issue what so ever. The battery is probably the only thing compact camera manufacturers struggle at. You need to raw power to process everything smoothly that runs behind the scene. That’s why you need bigger batteries. However, putting a big battery in a camera that aims to reside in users’ pocket most of the times is a challenging task. Fortunately, this camera comes with decent battery life. It can stay awake for 165 minutes or 330 shots on a single charge. That’s plenty if you are into casual shooting. you will never need to capture this many shots on a single day. However, if you are a pro and constantly snapping photos, I’d suggest you keep a spear battery with you. It’s good to be safe than sorry. It comes with a bunch of essentials. Rechargeable battery, AC adaptor, micro USB cable, wrist strap, strap adapter etc. are included with the package. So, yeah! You really don’t need extra bucks to spend just to buy the essentials. Top of the line sensor. Faster autofocus in the industry. Very fast burst mode with 24 frames per second autofocus. Long battery life. Can take 330 snaps on a single charge. As this is a premium camera, it is slightly on the pricier side of the spectrum. Fujifilm is another one of those OG companies that have been in the camera game for a long time. With their expertise and experience, they have produced a camera that I firmly believe is one of the best compact and lightweight cameras (if not THE best). What can I say? I am just in love with this camera. I’ve actually used the big brother of X100F (the X100T) and I must say, this update was totally worth it. In every possible aspect of photography, this one is better than the X100T. It comes with a huge 24.3MP X-Trans CMOS sensor. The sensor has built-in no low-pass filter and X-processor pro. It’s fast and efficient at the same time. It packs an 8-way focus lever. The number of focus points went up from 49 of the previous model to 91 in this one. The focus points can also go as high as 325. That alone is a huge improvement over the previous model. So, yeah! If you have one of those X100T models laying around, I’d suggest you get this one now. The built-in ISO dial has now been incorporated into the shutter speed dial. This makes operating this camera even easier and more user-friendly. Speaking of operation, the operating temperature of this camera ranges from 0 to 40 degree Celsius. I’ve been running this for the past month. During my heavy usage, I’ve never been able to make this camera go past the 40-degree mark. I’ve done everything I could to put this thing on the verge of the breakpoint and I failed to do so (trust me, that’s how good this camera is). The buttons of this camera are something Fujifilm should be proud of. I’ve never used any camera having buttons as tactile as this one. In case you were wondering, the legendary across the filter is finally here. Kudos to Fujifilm for that. Enough about durability and improvement over the previous version. Let’s talk about the image quality. We all know there’s no point in having a durable camera if it cannot produce quality images. Luckily of us, the X100F produces some of the best quality photos I’ve ever taken. The New np-w126s lithium battery is also something that’s great about this camera. We all know how Li-ion batteries can prolong the battery life of any device. And with this, you can now easily use the camera without worrying about changing the battery. In my personal opinion, X100F was the final chapter in Fujifilm’s X100 lineup. I’m glad I got the opportunity to become a part of the journey. New and Improved design over the X100T. Big sensor with no low-pass filter. Incredible image quality and sharpness. The joystick makes selecting an AF area a breeze. Manual controls are much well organized. No more shutter lag (yay!!). The revamped menu structure is much more informative than the previous versions. Canon is wildly known for making the best DSLR cameras. However, as the compact camera market is on the rise again (thanks to notoriously good smartphone cameras), Canon was destined to join the competitions. Not so surprisingly, they have done a decent job at producing some of the best compact cameras available in the market. Let’s see what Canon has to offer. Firstly, I’d like to mention how this camera is for video capturing. If you are into cinematography, you should have a go at this device. Advanced control and capabilities of G7 Mark II give it an edge over every other product in this list when it comes to video quality. This camera also comes with a variable aperture. For wide angle, it comes with f/1.8 and f/2.8 when fully zoomed. The goal of this lens is to capture good quality images with precision. And it sure does a good job at that. It comes with a large 1-inch sensor paired with a 20.1 MP CMOS sensor. This allows the sensor to capture more dynamic range while retaining the sharpness. It also has great low-light capabilities. This camera is incredible for broad daylight shots and amazingly good at night/ low-light scenarios. The TTL focus and manual focus gives you the taste of both worlds. If you are someone who loves point and shoot, go with the TTL focus. On the contrary, if you prefer finer control over everything and don’t like processing image in Lightroom afterward, go for the manual control. This thing is also really cool (literally) while operating. Just like the previous camera of this list, it also operates within 0-40-degree Celsius range. However, keep in mind it can get a little hot while charging. So, don’t be alarmed if it gets a little hotter while it’s charging. For those who love self-portrait, this camera comes handy. The 3-inch LCD display can tilt up at an angle of 180 degrees and down at 45 degrees. You can now easily take beautiful pictures of yourself with this camera. It has built-in Wi-Fi and Bluetooth. This enables you to post pictures on social media sites without having to transfer the data. Now that is what I call convenience. G7 can shoot continuously at 8 frames per second. This is ideal for snapping photos without wasting any time whatsoever. Best compact camera for cinematography. f/1.8 and f/2.8 for both well-lit and poorly lit conditions. The dynamic range of this camera is incredible. Both auto and manual focus available. Does not heat up even under heavy load. 8 fps continuous shooting ability. Small form factor that I prefer very much. Can only record at 1080p up to 4GB (which is not a lot). I’m someone who is always on the move. While traveling I like to snap quick photos as a journal of my journey. This camera was a perfect fit for me. So, if you are looking for the best point-and-shoot camera for traveling (with a big zoom and large sensor), the LUMIX ZS200 might be the one you should go for. As it comes with 15X zoom, it was just perfect for my wildlife adventures. I managed to snap some of the best bird photos I’ve ever taken. And I believe 15X zoom is way more than one could ever need. One positive side about this camera is that photos still contain a decent amount of details, even when fully zoomed in (thanks to the 20.1 MP sensor). It comes with a large 20.1 MP 1-inch sensor. We all know how good large sensors are for great color accuracy and overall brightness. This one is no different either. Photos and videos produced by this compact and lightweight camera are as good as it gets. This camera has few other tricks up its sleeve as well. There are a bunch of different modes for different scenarios. This gives you so much creative control over everything. Scene modes and filter modes allow you to have finer control over things. Aperture and shutter priority modes give you all the traditional options as well. This one is one of the few cameras in this list that can shoot native 4K videos at 30 FPS. This is great for those who plan on creating a career of off YouTube. With this, you don’t need to break your bank to set up your studio. It also comes with a Wi-fi module. With this, you can easily transfer your photos to your mobile or tab and send them to others via email (or whatever app suits you best). It also gives you the ability to snap photos while you are away from the camera via remote control (using your cellphone). Again, this is just perfect for wildlife photography stuff. You know what’s even more amazing? The in-camera editing option. With this, you can now edit photos right from the camera and get the final product without ever having to edit it on a PC. Although the options are very limited as of now, I believe this is still a great start. The battery of this camera is also great. With a full charge, I was able to use it for an entire day (around 350 photos were taken). However, as the battery is charged while it’s inside the camera, an extra battery might be a wise choice in the long run. Wi-fi and Bluetooth that allows you to operate the camera remotely. Big sensor for brighter and colorful images. Perfect travel companion for passionate photographers. LIMUX app allows for geotagging every picture. The aperture does get small while zoomed in. Next up in our list of best compact and lightweight cameras is the Leica Q. I must say this one is definitely in my top 3 picks. Leica has been producing quality lenses for quite some time now. They have built a reputation so great some smartphone manufacturers put a Leica lens in their phone and brag about it (they have every right to do so). Speaking of smartphone cameras, if you are into smartphone cameras as well, visit Androidista for more up to date news about smartphone world. Leica Q comes with its in-house (obviously!) lens that is nothing short of amazing. As you might have already guessed, I left the DSLR world. The main reason being the truckload of gears that I always had to carry. I must admit in my decision-making Leica Q had a great deal of impact. This camera made me feel ecstatic and I absolutely adore it. Enough chitchat. Let’s talk features and their benefits. This camera comes with 24.2 Mega Pixel full-frame sensor along with the legendary Leica Maestro pro II image processor. It’s really fast and produces great photos. Photos taken by the camera looks absolutely stunning. I was getting raw images that were as good as it gets. Colors are vivid and the focus is laser sharp. Everything about the image quality is great and each image just pops out. I can vouch for this camera personally. The lens is a Leica Summilux 28mm f/1.7 ASPH Lens. The f/1.7 aperture makes sure there are plenty of lights coming in. This results in photos that are brighter and detailed. The 3.68 MP integrated e-viewfinder is also amazing. The overall design is super gorgeous to look at. It is even better when it comes to handling. I honestly feel like this one is probably the most ergonomic camera I’ve ever held. The operation is also dead silent. The vibration-free leaf shutter is just the cherry on top. Integrated 3 inch 1,040k-Dot touchscreen LCD monitor is plenty sharp. It is also very responsive. The input lag is virtually nonexistence. Really easy to carry around. Probably the most compact camera of this list. Zero input lag on the touchscreen monitor. The dynamic range of this camera is insane. Placement of various controls is just on point. Performance in low light is underwhelming. Okay, let me start by expressing how much I cherish this camera. It comes in a very modestly sized package and has a lot of potentials. If you are not sure about the move from DSLR to compact camera, this camera might be your gateway to the compact camera world. Panasonic LX100 II is definitely one of the best compact cameras for beginners. This one comes with a baseline 17 MP camera with a 4:3 aspect ratio. This one also has a variable aspect ratio ranging from 4:3 to 1:1. This is one of those features that you just know are great. The 24-75mm Leica made lens comes with a variable aperture of F1.7 – F2.8. The camera performs incredibly well in both low and well-lit conditions. Low light photos have little to no noise or grain whatsoever. That’s what I found to be the most impressive. You know what the icing on the cake is? The OIS (Optical Image Stabilizer) of the camera. It does a very good job at decreasing jitters and handshakes from videos. It also minimizes unwanted blurring while you are zoomed in. This beast of a camera can shoot videos and photos at a 4K native resolution. The Panasonic exclusive 4K photo technology can go as high as 30 frames per second in 4K ultra HD videos and extract photos from them. So, yeah! The probability of you missing any specific moment is very close to zero. Are you into macro shooting? For instance, close-ups of flowers, insects, plants that require finer details. Well, this camera could very well be able to satisfy all your needs. With a 3cm wide angle and 30cm telephoto lens, macro photography feels like a breeze. I honestly can’t stress enough how good the camera is at macro photography. If that wasn’t impressive enough for you, I don’t know what would be. The battery life of this camera is also pretty standard. Nothing out of the ordinary. I was neither a fan not a hater of the battery life of this camera. However, there’s one thing that I was certainly not a fan of. That is the included flash. Well, what can I say? It was just disappointing. Actually, it was more than a bit disappointing. Other than that, I was really happy with the product. So, here’s what I would say to you guys. If you are planning on getting a compact camera with a great lens, electronic viewfinder, and touch screen monitor, go for the Lumix LX100 II. Perfect fit for beginner friendly macro photography. Shoots at native 4k resolution. Optical Image Stabilization for smoother and jitter-free videos. Comes with a variable aperture. Lens/sensor image quality delivers a great image every time. The Intelligent ISO mode is not so intelligent. Battery life can be a bit underwhelming for users. Ricoh GR II is probably the most budget-friendly compact camera out there. It is priced way below the premium price tag range. However, it does a decent job at providing the customers all the bells and whistles. Let’s see what GR II has to offer for us. Let’s talk build quality first, shall we? At first glance, it’s not that impressive. The build quality is kind of okay, but not worth writing home about. It is light despite being made of mostly metal (which is a good sign as we want our camera to be compact and travel-ready). The battery compartment looks like it was understated to the extreme. It’s cheap and it looks cheap as well. The sticky and plastic-like feel of the battery door is not something they should be proud of. However, the camera is very sturdy and feels solid in the hand. So, that’s a plus. One thing that GR II definitely has going for itself is the battery life. On a full charge, this camera can shoot 320 stills or 45 minutes of 1080p video recording or 190 minutes of playback. In my extensive period of usage time, I never had to worry about battery life. Like some of the cameras mentioned above, this one also comes with Wi-fi. Connecting with mobile devices is not a problem. One thing that is unique to this camera is (in this list) NFC (near field communication). As my smartphone was NFC compatible, I instantly fell in love with it. The quality of the lens is also decent (considering the price point). It shoots stills that are social media ready out of the box. Advanced GR engine V enables this budget compact camera to shoot produce images with minimal noise and color rich. Also, the anti-aliasing allows it to make images much sharper. The video quality is lagging a bit behind. It shoots at 1080p resolution at 30 fps (although this is 2019, considering the price range, I’d say 1080p isn’t that bad). Although it lacks OIS or EIS, the continuous autofocus system does make it up for a little bit. The included computer free image processing system is a bit audacious but a step in the right direction. GR engine V that helps produce a better-quality image. larger APS-C size sensor ensures better resolution. Although it’s built with durable metal and all, the design choices make it look like a cheap product. They did cut some corners to cap the price range below-premium price range. 1080P video shooting in 2019 is a bit underwhelming. Hey, look! Another one of Panasonic’s camera on this list of best compact and lightweight cameras. It seems Panasonic has mastered their game at making compact cameras. In case you didn’t check the title heading, this camera is also from the LUMIX series. This should not be of any surprise as Panasonic LUMIX cameras have constantly been good previously. And this one is no different. LX10 is the definition of point and shoot camera (in my humble opinion). The 20.1 megapixels large 1-inch CMOS sensor paired with 3X zoom is a bestial combination. It produces sharp, high quality and noise free images almost in every scenario. 24-72mm VARIO-SUMMILUX lens and the O.I.S gives you images that are brighter, more colorful and little to no distortion or noise. I’ve been using this camera as my daily driver for the past 2.5 months and I am very happy with how things have turned out to be. Are you into high-quality selfies? If your answer is yes, then you would love this camera. It comes with a tilting display that can tilt upwards at a 180-degree angle. As the display is a touch screen, popular gestures like pinch to zoom, swipe to discard etc. have also been implemented. This camera is also a champ when it comes to video recording. It can capture 4K video (3840 x 2160) at 30 fps. To compete with this raw power great battery life was needed. So, Panasonic made sure they put a big battery inside this bad boy. The post focus feature is something that I fell in love instantly. Basically, what it does is allow you to set specific focus point/s after the photo has been taken. Do you like manual controls? Yeah, so do I. With that thought in mind, LX10 comes with a lens-mounted ring that allows you manual controls over different variables. 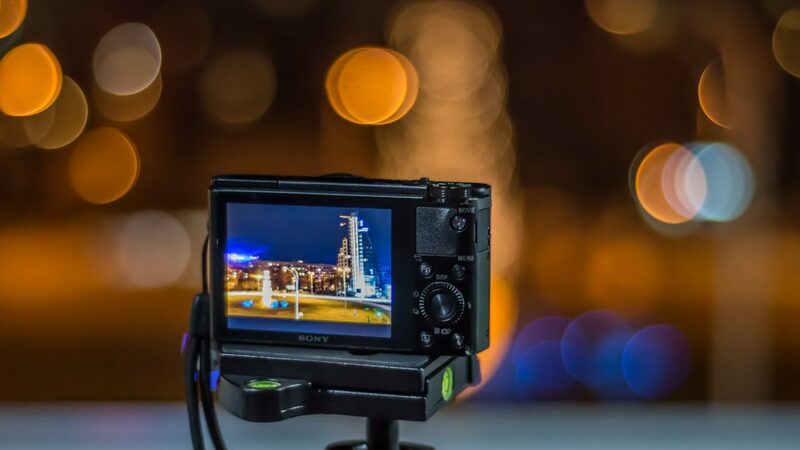 This gives you a feel of DSLR- like control on a "Point and Shoot-style" compact camera body. There’s no point in buying a compact camera if you can’t trust it while you are traveling. That is precisely why LX10 was built to be travel ready. With USB charging, Wi-Fi connectivity and compact design language of this camera, you are always travel-ready. Makers included micro-HDMI which provide you with the option to connect with a variety of different devices. It is just the cherry on top. I highly recommend this compact and lightweight camera to everyone. High-quality lens with variable aperture. 4K video recording with post focus selection. Wi-Fi connectivity, USB charging, and micro-HDMI port. 3-inch touch screen display that can tilt at an angle of 180 degrees. The lens gets scratched pretty easily. I’d suggest you keep the lens always clean. I personally am a huge sucker for red and black design. So, naturally, I instantly fell in love with the overall aesthetic of Olympus TG-5. Just have a look at it. I’m sure you’ll also love the design of this camera. The camera also feels very well built. However, we all know design is not everything. What looks pretty outside might be way uglier inside. That’s why we need to go a little deeper down the rabbit hole. Fortunately for us, the TG-5 comes with a very feature packed profile (considering the price point). It comes with a new and improved 12 MP fast image sensor. Their end goal was to perform better in low light while reducing the noise level. And they sure did a great job at it. The fast speed of the sensor allows it to capture photos instantly. This, in return, reduces noises while capturing as much light as it can. Another great thing about this camera is the microscope mode. You focus an object at a distance of 1 cm and zoom 4X optically. It is great for microphotography. Images captured in this mode is plenty sharp. The dynamic range of this camera is also decent. This camera is also waterproof. Although there is not official IP rating for this camera, it can stay waterproof up to 50 feet underwater (as per the manufacturer). I am yet to do an extreme underwater test on this camera. So, I can’t vouch for them yet. This feature had a great deal of impact while I was making this list. This combined with a fast sensor with F 2.0 aperture makes this camera a perfect underwater photography tool. If you are into scuba diving, you’d definitely want to have this on your next dive. The focus Stacking technology is simply amazing. What it does is stack multiple photos together. This results in much sharper and detailed photos. It also comes with other common features like Wi-Fi, standard USB 2 charger, 4K video recording etc. However, I was very disappointed with the quality/ strength of the Wi-fi. Other than that, everything was on point for me. I’d highly recommend you try the Olympus TG-5 out. Fast sensor with F 2.0 aperture. Microscope mode is simply amazing. Waterproof up to 50 feet. A perfect companion for scuba divers. Overall build quality feels really good. Works with standard cables rather than some form of proprietary peripherals. The user interface needs improvements. Focus stacking can sometimes work unpredictably. Last but not in the least we have the Sony RX100 M4. I was initially planning on excluding this one as I’ve already included RX100 M6 in this list. However, after trying this camera for a short period of time, I felt it would be an injustice to this camera. So, here we are. Like all premium Sony cameras, the M4 also comes with every bell and whistles you could think of. With a few exclusive tricks up its sleeve, this compact and lightweight camera is definitely worth the price tag. It comes with world’s first 20.1 MP 1-inch Exmor RS stacked back-illuminated CMOS sensor. For those of you who are not familiar Exmor RS, it is a fancy noise reduction technology. Most cameras reduce noise in a single step. With this technology, Sony sensors reduce noise in two parallel steps. The result is nothing sort of a miracle. It can shoot videos at 4K with direct pixel readout and no pixel binning. If shooting video is your prime concern, you should definitely get this camera. This is the only camera in this list that can shoot slow-motion video at 960 frames per second. To put things into perspective (and praise Sony a little bit), only Sony sensors are capable of this (as of writing this article). Okay, so this camera is great for video recording. How about still photos you ask? Well, it is just as good. The incredible anti-distortion shutter which operates at 1/32000 sec up to 16fps is perfect for any situation. The variable aperture (f1.8 – f2.8) of this camera is also ideal for any sort of scenario. With all these features the camera needs raw power to operate smoothly. Sony has put a great deal of thought into this as reliability was an issue for Sony compact cameras previously. That’s why they have made sure this camera does not get too hot or unreliable. Operating temperature of this camera is 0-40 degree Celsius. I’ve never felt the urge to put the camera down as it remained very reliable to date. The retractable OLED Tru-Finer electric viewfinder combined with a sharp 3-inch LCD monitor is a match made in heaven. The inclusion of Wi-Fi, NFC, and other sweet features makes this camera even more appealing. This camera is the living example of compact camera revolution. Large 1-inch 20.1 MP sensor. Exmor RS stacked back-illuminated CMOS sensor (first of its kind). 960 fps super slow-motion video recording. Variable aperture that is perfect for all sort of lighting. Electric viewfinder that provides twice as many dots as opposed to other cameras. Taking group photos can be a bit challenging. Excessive 4K recording can cause the camera to overheat. How to Choose the Best Compact Cameras Out There? So, you’ve read the review and you want to know based on what I chose these cameras? Or perhaps you want to buy one yourself but don’t know which one to choose. That’s where this guide comes in. If you follow this guide you are more likely to land a killer camera than not. So, without any further ado, let’s get in. This is perhaps the most important factor of any camera. The sensor of a camera is directly equivalent to old day films. This is where all the magic happens. The size of a sensor dictates how good the photos taken will be. Typically, the bigger the sensor the better it is. Before 2012, small sized sensors were much popular as people mainly bought compact cameras as a hobby piece. However, as compact cameras are getting better and better day by day big sensors are now more popular. Currently, the industry standard for a sensor is 1-inch. Anything less than that is considered subpar. Aperture is equally important as the sensor size. As mentioned earlier, the aperture is basically the size of the hole inside the lens. Through this hole, the light comes in. Aperture is actually denoted like FX.X. where X implies numeric values. Here, F is the focal length of the lens. Focal length is disproportional to the aperture. That means small F values imply a bigger aperture. Bigger aperture means more light and vice versa. Ideally, you’d want something that is right in between. Almost every camera mentioned in this review had a variable aperture. So, if you choose one of those, you are all set to go. Compact cameras are one of the most abused pieces of tech you can find. You carry them in your pocket without any protection. So, naturally, they are prone to breakage. That’s why you should buy a camera that has strong build quality. Have you ever felt the output of your camera is a bit off? It is always blurry and videos have way too much shakiness? Especially, when the video was shot zoomed in? Well, you are not alone. The main culprit is the lack of image stabilization. I don’t know about you, but it’s literally impossible for me to hold the camera super still while I’m shooting. Unfortunately, the tiny motion created by moving hands can cause blurry photos and jittery videos pretty easily. That’s why having some sort of OIS or EIS is paramount. Luckily for you, all the cameras mentioned in this list have some form of image stabilizer. Optical Zoom for Distant Photographs? This perhaps is one of the main reasons why travelers still choose compact cameras over smartphone cameras. In case you did not know, optical zoom signifies the difference between most zoomed out and in settings. For an instance, if you optically zoom in on an object at 10X zoom, it will look 10 times bigger than its original size. This comes really handy in wildlife photography and when you are far away from the object. I’d suggest you find a camera with at least 8-10X optical zoom. How Good is the Manual Control? Although most people leave DSLR life because they don’t want to deal with all the complicated settings, it’s still good to have manual control over everything. Point-and-shoot is great. But every once in a while, you’ll find yourself in a situation where I’d wish for manual control (trust me this happens). That’s why having a backup manual control is a good thing. Moreover, with manual control, you can do a little bit of processing before you shoot the image. That, in my opinion, is pure convenience. In 2019 a camera without 4K video recording is not a complete package. Sure, you might have a different use case scenario. But having 4K video recording ability is something you never knew you needed until you actually use it. Battery life is also very much important. You would not want your camera dying on you right before you get the chance to shoot the tiny little bee you’ve grooming for the past 2 hours. Trust me, nothing is more frustrating than this. That’s why whichever camera you buy, make sure it has enough juice to go full day. Typically, you would not be shooting more than 350 pictures. Just keep that in mind before you make the buying decision. This is a bit of a luxury in my opinion. But I think you should also consider extra features like Wi-Fi, NFC, Bluetooth, different shooting modes, etc. before you decide on a camera. Another important factor is peripheral support. Try to avoid cameras that come with a proprietary peripheral set. They are hard to repair/ find in case an emergency occurs. Stick to something that is industry approved and easily repairable. How Does a Compact Camera Work? A compact camera also is known as point and shoot camera is a small and portable device that was designed to make photography available to everyone easily. In baby terms, it is a camera that is just smaller than typical DSLR cameras. To its core, every compact camera follows a principle that is very similar to DSLR. Light comes through the lens and creates an image on the sensor. That is pretty much it. The only difference is that there is no mirror system to reflect light into an optical viewfinder. Rather compact cameras use full time live view on the LCD screen (although some compact cameras do have optical viewfinders). In case you didn’t know, the mirror box is what takes up most of the space of a DSLR. Removing this resulted in a camera that is very compact in nature without sacrificing too much quality. The biggest obstacle to creating a compact camera that could compete with DSLRs was contrast-detect autofocus. This feature was the prime reason why people were so much into DSLRs. In the early days, the first few units were no match for DSLRs as they were pretty bad at contrast-detect AF via the LCD viewfinder. However, with greatly improved sensors and autofocus algorithms, compact cameras are definitely giving SLRs a very hard competition. As technology is improving, compact cameras are not that far behind traditional DSLRs. And I believe within a few years they will make DSLRs obsolete (unless DSLR manufacturers do something which is totally out of the world). Initial failures put aside, the current generation of compact cameras are very capable photography tool indeed. The removal of the mirror paved a way for many advantages over DSLRs. Faster shutter speed, reduced size, and weight are some of them. The main goal of any compact camera is portability. Nobody likes carrying a bunch of stuff just so that one camera can work properly. That’s why compact cameras will always have an edge over DSLRs when it comes to portability. Plus, the reduction in weight is also very convenient. Perhaps the main disadvantage of any compact camera is the EVFs (electric viewfinders). They just aren’t that great. Sure, they are improving day by day, but they aren’t just the real thing. They introduce image lag in low light and more noise which makes framing a bit harder. Moreover, most compact cameras come with EVFs that are far smaller than an optical equivalent. On the positive side of the spectrum, EVFs give you a "what you see I what you get" feeling. It also gives you a 100% field of view which is virtually impossible in DSLRs. Another downside to this is the inability to switch lenses. DSLRs allow you to switch lenses whenever you want. On the other hand, you are pretty much stuck with a single lens on a compact camera. People want options and this certainly goes against that. So, there you have it. This brings us to an end to our review of best compact and lightweight cameras. Compact cameras have taken the world by a storm in recent years. The main reason behind that is convenience. Doesn't matter if you are a casual photographer or an expert, once you get the taste of a compact camera, you’ll never go back. I believe it is high time you guys gave a compact camera a chance. Especially, if you are a traveler. Who knows!? You might end up with the best point-and-shoot camera for travel. Nonetheless, I’d very much like to hear your opinions and suggestions. So, don’t forget to drop your thoughts in the comment section below. Also, feel free to share the best photo captured by you.